Tom Petty and the Heartbreakers return to the Bay Area before a sold out crowd at the SAP Center in San Jose was a joyous performance to observe for all as those in attendance were treated to both the crowd favorites they came to hear and a select sampling of cuts from one of the bands strongest new albums in years. Opening with a cover of the Roger McGuinn penned “So You Want to Be a Rock ’n’ Roll Star” from The Byrds 1967 album Younger Than Yesterday, Petty and the band didn’t waste any time providing a fitting tribute to the type of jingle jangle sound they’ve been long associated with. Next came their MTV smash “Mary Jane’s Last Dance” which set the tone for “American Dream Plan B”, an old-school rocker that’s the first single from the new album and was one of a very modest four high quality tracks performed from the recently released Hypnotic Eye, Petty’s first studio album in four years and 16th overall ( three solo ). Amazingly the only No. 1 Billboard album the band has ever recorded, the album is strong throughout and the new cuts didn’t distract the band in the slightest from still being able to perform the best older tracks and most familiar hits from their extensive catalog along with a few stellar deep cuts. A splendid Bemont Tench piano introduction to the powerfully delivered “A Woman in Love”, an often overlooked rocker from the 1981 gem Hard Promises followed. Next up was the new tune “U Get Me High”, a mid-tempo single in waiting and tale of affection likely to join the long list of many fan’s classic Petty favorites for years to come. “Rebels” from 1985’s Southern Accents was performed in a stripped down acoustic version that actually presented the originally upbeat tune in a more mellow light than the raucous “Yer So Bad” that followed it. Altering the tempo of “Learning to Fly” by stripping it down to not much more than some light percussion turned it into another crowd sing along before Petty brought the pace back up yet again with the bluesy “Shadow People” from the new album, the fourth and final Hypnotic track of the night. 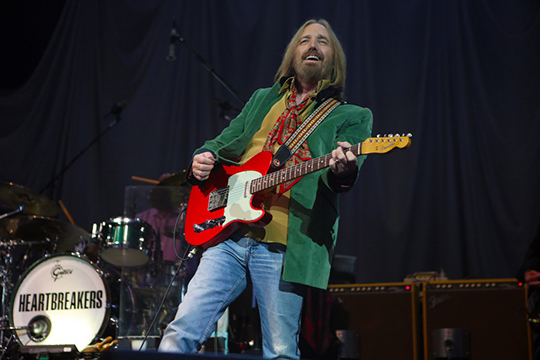 The 63 year old Petty, now in his fifth decade of making music, has often described himself as a ‘cranky hippie’. Not coming across that way at all he amped it up to another level with “Refugee” and “Runnin’ Down a Dream” as he traded guitar licks yet again with Campbell, bringing an end to a strong set that kept almost everyone on their feet for the entire show and led to encore screams punctuated by enough cell phone flashlights to put the old days of hand held lighters to shame. The one time Traveling Wilbury and his band of Heartbreakers returned to lead the crowd thru a clap along “You Wreck Me” before completing the polished two hour set with “American Girl” from the bands self-titled debut album. The one time scowling punks who opened up for the likes of Blondie, the J.Geils Band and Meatloaf early in their career have evolved into one of the most consistent producers of hit records for two generations of fans and one of the most crowd pleasing bands in the land. These kids are definitely alright.